Kristian Salermo, Briony Bruce-Johnson and of Zuzanna Gil-Dunne. 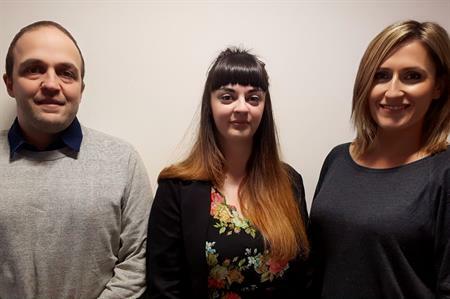 BCD Meetings & Events (M&E) has confirmed the appointment of Zuzanna Gil-Dunne as senior project manager and Kristian Salermo and Briony Bruce-Johnson as project managers. A spokesperson said the company has landed a number of recent business wins, with the new roles reflecting its increasing market share within the life sciences sector. Gil-Dunne said: "Joining the BCD M&E family is a great way to kickstart the new year and I can’t wait to start working on a wide range of projects for our life sciences clients." The trio bring a wealth of knowledge to the team, with more than 25 years experience in the hospitality industry between them, having worked across production, agency and venue companies. Senior director of EMEA Meetings Management Hannah Kelly added: "As our knowledge and strength in the sector has seen us grow our portfolio with new multi-year client contracts, we have looked to source the best talent in the industry and believe we have made a fantastic choice in our three new additions. "In addition, we are predicting continued strong growth in this sector with growth of around 40% in revenue."